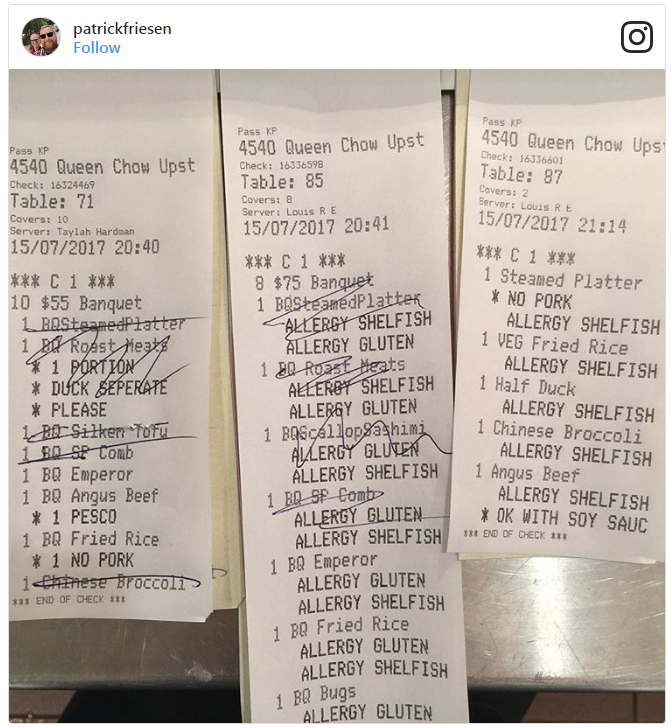 Queen Chow Head Chef Patrick Friesen is fed up with people who claim to have food allergies. He said many people who come to his restaurant often don’t actually have an allergy. Friesen said some of his customers who say they have an allergy are actually dieting or claiming to have a gluten intolerance because they don’t want to consume as much bread. He said the problem stems from people who claim they have a gluten allergy and don’t want bread but order a dish with gluten in it. He said the trend is problematic for people who have an actual allergy to gluten, peanuts, etc. Friesen decided to share some of the orders on Instagram that were loaded with conflicting dietary requirements. He said started it by saying, people who have a dietary requirement should know what they can and can’t consume. He said people with a shellfish allergy shouldn’t be eating oyster sauce. People who need to be gluten free won’t eat bread, but other foods with gluten in it are okay. He said vegetarians wouldn’t eat meat but are fine with a chicken wing. Friesen said these folks are making it extremely difficult with real allergies to enjoy dinner out. There have been a number of people who agreed with him. One user wrote that they are a celiac and get sick from time to time from gluten consumption, but are frustrated by the people who believe they have a gluten allergy but still eat foods with gluten in it. They wrote it makes it harder for those with real allergies to be taken seriously. Another commenter said they had a situation where a woman asked for gluten-free bread, but if they didn’t have any, she’d be fine with brown bread. They said it makes it difficult to know if somebody truly suffers from an allergy. Several commenters suggested Friesen stop being so judgmental. For instance, a commenter said their mother had lupus and was on a strict diet that appeared to work her. She doesn’t have quite the same reaction as a person with celiac disease as with gluten, but she does have side effects from consuming it. The commenter wrote that Friesen should do his job and stop complaining about it. If he wasn’t happy, the commenter suggested he quit.